How to Properly Inflate a Speed Bag? 5 Comments on How to Properly Inflate a Speed Bag? There are a lot of reasons to inflate your speed bag and in this guide, you will find how to do it properly without causing any deformation and lowering the durability of your speed bag. These steps are quite clear and you can follow them easily. 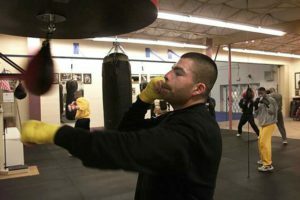 After that, you can read how you can make your speed bag quiet and I also added my personal recommendations for it as well. So What are the Reasons to Inflate a Speed Bag? Why Should not You fill the Speed Bag with Sand? How Can You Make Your Speed bag Quiet? Your speed bag’s bounce rate may not be good. It might be too fast and you may not keep up with the rhythm no matter what you do. In order to get the benefits of speed bag training properly, you may need to inflate your speed bag just a little. Or you may replace the bladders too often because your bladders are just not durable enough for the constant punishment. Or you may just want to try another bladder type and see whether you like it more or not. These are the common reasons to inflate a speed bag. And here is a complete guide for it. First of all, unlace all the laces so you can find the valve. You need to get an air pump with a needle which matches with the speed bag’s valve. Firstly, remove the cap. After that, place the needle to the valve. Place the needle in it and simply inflate the bag with the air pump. After that, make sure that there is no air in it. You can control it with your hand and that is it! This method is just perfect for every speed bag brand including Everlast and Title as I implemented it more than a thousand times with these bags. However do these gently as many speed bags’ this part can have deformation quite easily. If it has deformations, it can start leaking air and you may need to buy a new one. If you are looking for a quality speed bag which is durable and can handle constant filling and inflating, you can check out the reviews of good speed bag models. Well, there are different opinions about this but I am strongly against filling a speed bag with sand. Firstly, the speed bags are not constructed to use sand as a filler. Even though you use the sand inside of a rubber or plastic bag there is no way that it can withstand strong punches. 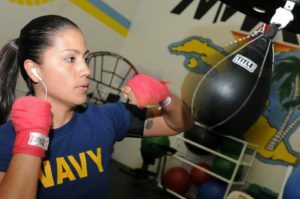 So you need to control the intensity of your punches all the time and even though I consider myself as a seasoned fighter I really can’t do that all the time. After all, sometimes I just lose focus etc. And when you can’t punch lightly all the time, trust me your place or gym will be a total mess and it takes time to clean this up as I did it countless times for heavy bags which leak sand for years. It was truly a nightmare. 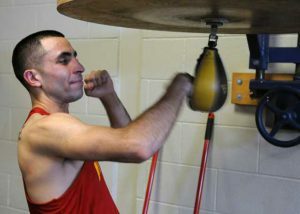 Basically, you constantly need to do very light punches so the speed bag, which is filled with sand, can last longer. How to fill a Speed Bag with Sand as Filler? First of all, cut a lot of rubber circles which have 4, 5, 6, and 7-inch diameter. Put the smallest one at the bottom. Because this area is the smallest. Then put a bigger one on it. Continue doing the same until you get the middle of the speed bag. Do the same for upper part of the speed bag. Then get a plastic or rubber bag and fill it with sand. There is not any hard rule for how much sand you should use. It actually depends on the thickness of the rubber pieces which you cut earlier. However, you should fill at least half of the bag and it should not exceed more than 80 percent of the bag. I also recommend that the thickness of rubber circles should not be more than four millimeters. If it is more, there will not be enough space for the plastic bag. Alright, this bag, which is filled with sand, is obviously heavier. The meaning is that regular speed bag swivels just can’t handle it and these can even break! So you need to get a chain and it should be around 10 inches length. The chains are sturdy enough to last way longer than the swivels. One thing is to note that this bag has more freedom to swing and it is quite fast. So the bag comes at you faster and you can improve reflexes, hand-eye coordination… Thanks to more freedom you can do more footwork as well. It swings like a double end bag. So you can also position your head according to the bag. Basically, you can also work on your defense and do counter punches. In addition to that, it is possible to do more punch combinations. You can see that it can be a great training tool for martial artists. The speed bags, which are filled with sand, simply offer more. But as I stated the durability of these is way lower than the speeds bags which are filled with air. However, there is a good alternative to this and you can find it below. By the way, emptying these bags is quite easy. You can just empty some sand and test whether the speed bag’s bounce is good or not. With that being said, double end bags improve the same skills like improving defense and they do it more effectively as these have more freedom and swing more. So considering these there is no point of filling the speed bag with sand to get these benefits. You can just train with a double end bag. How to Make Your Speed bag Quiet? Well, I don’t have a speed bag platform at my own home but I have buddies who have it. Some of them said that their neighbors complain about the noise and come knocking on their doors. Also, it is really disturbing that if speed bags make a lot of noise in martial arts gyms. We sometimes can’t hear what people say. If you are experiencing one or more things above or just want to train more silently you can have a look at the following tips. First of all, does your speed bag platform’s drum have any quality? It should be made of wood and I found out that oak just does a better job to absorb the constant punishment and reduce the noise. Also which type of speed bag bladder do you use? The reason of noise just might be it. Speed bags, which have plastic bladder, are faster and can make more noise. If you are using a plastic bladder you can try rubber bladder out and see whether there is a difference or not. The cover material of the speed bag also can cause noise. Let me explain. You are pounding the bag constantly and it is likely that there will be some rough spots in the future. Well, I always go for more affordable speed bags so this happens to me a lot. If your speed bag platform’s drum is made of some kind of metal while these rough spots are contacting the drum, it creates a horrible noise. So make sure that your speed bag’s cover material does not have rough spots. Lastly, sometimes speed bags don’t get on the swivels well. This can make a lot of noise. And it is quite easy to figure out as this creates a mechanic noise. Even though this is a quite rare case I run into this problem with the swivels which have a rectangular shape. So if you have a drum, which does not make noise, and you use a decent speed bag bladder you might want to change the swivel. And you might want to pick one, which is made of quality steel, as swivels, which are made of low-quality materials, also cause issues with the speed bag in the future. The plastic joint can get a lot of deformation and this causes bounce rate issues. After that point, you definitely need to get a new speed bag and swivel. So shortly choose your swivel carefully. These are everything about how to inflate a speed bag and tips for making your speed bag quiet. I hope you enjoyed reading and if I missed anything, want to add more information here or have anything to ask, just have a comment below. Thank you for this great write up! One question, for a woman who is small and is just starting out, what is the appropriate air pressure for the bag? Should you take a little air out so it will not move as fast? Also, are there bags that are smaller, say for smaller hands? Thank you. It should not be extra filled as if you do, these will be really fast and a beginner can’t punch the bag well. So you are right. If it does, just inflate the bag and try punching it again. No, smaller bags move faster. And beginners should go with bigger ones as these are easier to punch. Thank you so much for this post. I am still not sure if I will fill my bag with air or sand as I see advantages and disadvantages for both but I love that you have given me so much to think about. Also the tips on how to make it quieter is brilliant. Thanks again, great article. You are welcome. Many people don’t have a clue what will happen if they fill the speed bags with sand. I hope they will read this article before they do. Great breakdown of the different options available for speed bags. You need to weigh the pros and cons and find what suits you the best.